Claire Clarke's mil hojas recipe is a great celebration bake for those who shy away from traditional sponge cakes. 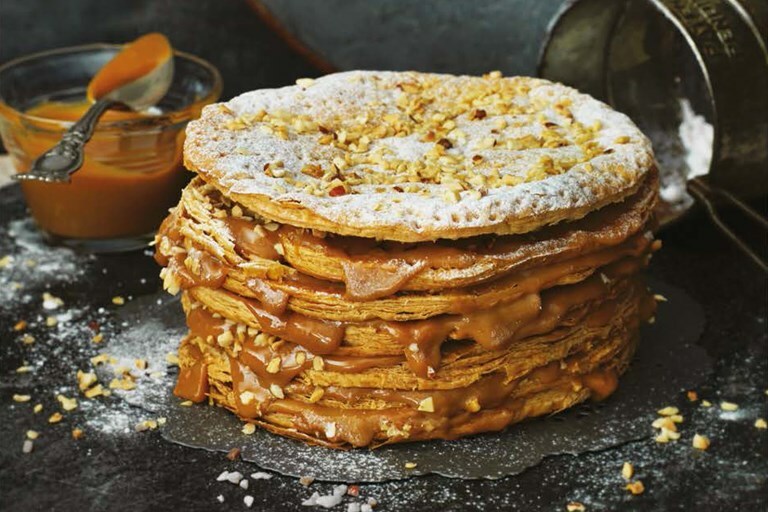 A Chilean version of mille-feuille, this stunning creation boasts decadent swathes of dulce de leche and pastry cream between crisp puff pastry layers. This recipe is taken from 80 Cakes From Around the World by Claire Clark, published by Absolute Press. This is the Chilean version of a millefeuille, or thousand leaves. In Chile it is sandwiched together with dulce de leche. I have made it a little more like the French millefeuille here by using a pastry cream flavoured with dulce de leche as well as the straight-up milky caramel. Walnuts add crunch and extra flavour to the buttery pastry and caramel. This is best eaten on the day it is made, as the filling will cause the pastry to soften. It's perfectly okay to make the pastry layers one day and fill them the next. Just put them back into the oven for 10 minutes to refresh them before cooling and filling. Claire Clark is regarded as one of the top three pastry chefs in the world. Claire is now a freelance chef consultant based in London.